Upon approaching Black & Blue restaurant on Wall Street in Huntington you’ll notice the restaurant has an elegant curb appeal. A rich black awning, wrought iron style street lamps and matching black umbrellas create this upscale appearance. The outdoor dining area is very cozy and charming and sets the tone for what awaits you inside. At the helm, Executive Chef Steven Del Lima has worked in numerous kitchens alongside many acclaimed chefs. Some of those names include Aureole, Le Bernardin, Cascabel and Giorgio. His first appearance on Long Island was at RSVP in Bayville. His diverse background is evident in the amount of choices on B&B’s menu. Lou, the owner, was proud to inform us that his entire staff has had a chance to view and taste each dish, so they have the best understanding of what they are serving. It also allows each server to better assist guests with their dining selections. Bold cherry wood tones surround you in the dining room, which creates an elegant yet casual atmosphere. The double sided fish tank adds great warmth to the room. Techno jazz music filled the air and provided a unique white noise effect. The tables were dressed with blue and gold table cloths. Each customer was greeted upon entrance with friendly faces and smiles. The table was thoroughly impressed with Rocco our waiter. He was extremely knowledgeable of the menu. We also learned that Rocco was trilingual and had lived in Italy during his childhood. Once seated at the table, homemade rosemary and black olive focaccia was served while we browsed over the specialty drink menu. Some of the drinks featured were Light Rasmopolitan, Ice Wine Martini, Blueberry Cobbler and Orange Caipirinha. The Asian Pear Martini was selected, and proved to be an excellent choice. Paper thin slices of an Asian pear adorned the martini glass that provided a smooth, silky flavor of pear. The first appetizer of the evening was B&B’s All Natural Grass Fed Argentinean Beef & Gorgonzola Fondue (above left). The beef was very tender and melted in your mouth, which was an excellent complement to the rich, creamy gorgonzola fondue. This appetizer can be prepared for 2, 4 or 6 people. Next was the Maine Lobster Bisque (above right) – Fresh Maine lobster meat with a hint of Sherry, spiced “cappuccino” cream, and caramel popcorn “croutons.” This soup had plenty of lobster meat and the caramel popcorn croutons were the perfect addition. The Calamari (top left) can be served in two manners; the first is Lemon Pepper Style or Zesty Thai-Chile Style. We sampled the latter. It was served with Wakame seaweed salad, mini Tabasco, B&W sesame, and toasted peanut crunch. It was not too spicy, and it had a subtle hint of sweetness. The fourth appetizer presented to our table was the B&B Wedge Salad (top middle), which was a wedge of Boston Bib, Maytag bleu, shredded carrots, herbed polenta croutons, fire-roasted peppers, warm smokehouse back vinaigrette, and frizzled onions. The ingredients came together to create a nice marriage of flavors. The last sampled appetizer, Coconut Shrimp Salad (top right), combined wild arugula, toasted filberts, mandarin oranges and Peach Melba emulsion. The shrimp was crisp and crunchy. The Peach Melba offset the bitterness of the greens. The first entrée presented to our table was the Cedar Plank Roasted East Coast Halibut (top left) served on a wood plank with lobster home-fried potatoes, sautéed baby spinach and black trumpet mushrooms with a cabernet-merlot butter. The lobster potatoes were tender and flavorful. The succulent halibut was brought to a new level with the cabernet-merlot butter. The Bamboo Steamed Florida Red Snapper (top right) arrived in its own steamer. The twelve-hour tomatoes, marinated artichokes and Santa-Barbara olive relish surrounded the Snapper with flavor and texture. Our next entrée was a preview from the new menu – Kona Kampachi (top left). Rocco informed us it was a firm fleshed fish, not as meaty as a swordfish, and not as light as a flounder. It was presented over red cabbage and tri-color cous cous, asparagus and a warm spinach cream sauce. The flavor of the new fish went well with the tart cabbage, it was a unique pairing. Sour Dough Pretzel Crusted “Frenched” Chicken Breast (top right) arrived atop a flavorful grain mustard-tomato and leek risotto. The large portion of chicken was topped with arugula and fennel fricassee. The crust tasted just as a sourdough pretzel would. Our fifth dish was the Jalapeno Bacon Wrapped Filet Mignon (top left). A 10 ounce center cut filet was presented over Great Hills Gorgonzola roasted fingerling potatoes. The plate also had lemon accented baby spinach and roasted eggplant-tomato jam. The filet was tender and delicious; the presence of the bacon only enhanced the flavor. And lastly we were treated to Black and Blue’s perfectly cooked 10 ounce “Cowboy Rubbed” Bone In Ribeye (top right) with caramelized onions. The dish also had a Maytag bleu cheese potato cake, which was amazing. The dessert menu offered a variety of choices. The Summer Tea Crème Brulee (above left) was thick and tasty. B&B’s Cheesecake (above center) was a vanilla bean blueberry swirl cheesecake with a crushed Oreo cookie crust and fresh berries on top. Our favorite dessert was the Milk Chocolate Peanut Butter Bar (above right). 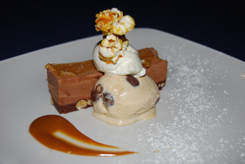 A perfect portion of milk chocolate peanut butter mouse, caramel popcorn, malted milk ball gelato, and rum-caramel sauce created this treat, and it was exquisite. If you are looking to try a new restaurant this would be one of my first recommendations, especially since I know Rocco and Lou were working together to create new additions to the already impressive menu. 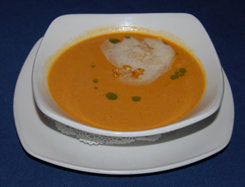 The kitchen is imaginative with each of their creations, and surely will impress you and your taste buds. The presentation of each dish was consistently unique.